Snap-On Smile is a non-invasive cosmetic, removable full or partial arch that literally snaps over the patient’s existing dentition…without impinging on the gingival tissue or covering the palate. It’s completely supported by your existing teeth, so no adhesives are required. You can eat, drink, and function normally all day, every day! However, it does have limitation and take time to get back to normal life, just like everything in life. 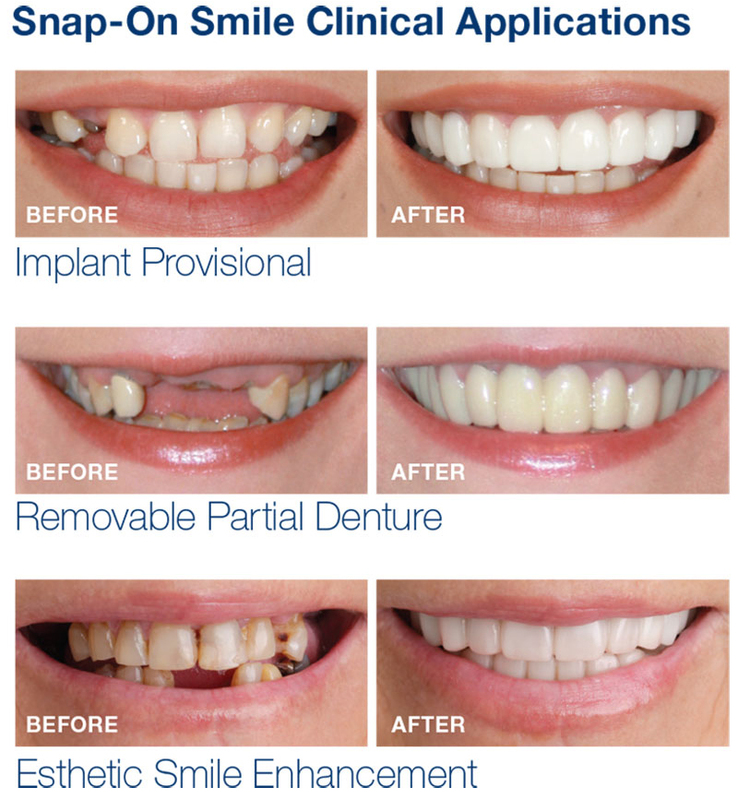 If you are hesitant to commit to more involved treatments such as implant placement and restoration, Snap-On Smile gives you the experience of living with better function and superior esthetics. Snap-On Smiles can cover a full arch if you are missing teeth on both left side and right side. Or it can cover partially if you only miss teeth on left side or right side. Snap-On Smile is similar to removable partial denture. Both rely on your existing sound teeth and can be removable that you can clean them during the day or at night. Unlike removable partial denture, Snap-On Smile can close gaps between teeth even if the gap is not big enough to place a tooth. One good benefit from Snap-On Smile is that you don't need any invasive treatment like crowns as long as your existing teeth are sound.